Steaming, succulent and savory. 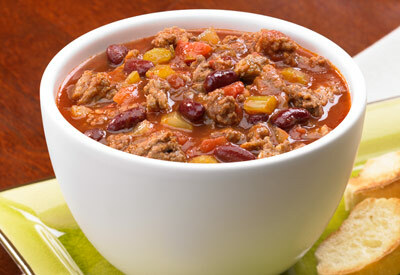 A robust and hearty classic that never goes out of style! In a large saucepan, cook sausage and ground beef over medium heat until meat is no longer pink; drain. Add the onion, celery and garlic. Cook and stir for 5 minutes or until tender. Stir in the tomatoes, beans, broth, tomato paste, brown sugar, chili powder, Worcestershire sauce, cumin and red pepper flakes. Bring to a boil. Reduce heat; cover and simmer for 20 minutes. Sprinkle with cheese if you like and serve immediately.